To Jump to GolfCartResource.com’s Visage Q&A with Club Car’s Vice President of Connectivity, Robert McElreath, Click Here. Looking back over your ongoing relationship with golf carts, it has been pretty much a one-way exchange. You turn the key to on, move the lever to forward, step on the pedal and you are on your way. The cart never acknowledges your presence, gives you any helpful tips or helps you survive the wait on the tee at the bothersome par three, third hole. That relationship has now changed, thanks to a unique partnership between golf cart veteran – Club Car, the nation’s largest GPS provider – Verizon, and the Shark himself – Greg Norman. This combination of golf innovators has resulted in the creation of Visage, which helps both players and golf course operators work better together. 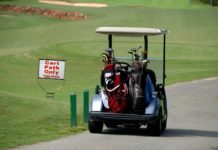 What all does Club Car’s Visage offer? The system offers real-time, two-way communication between the course operator, the player and the cart. The operator will be able to track each individual cart, see exactly where it is on the course, determine if the pace of play is ok or falling behind and assure the cart stays on paths where it is necessary and stays away from hazards and crossing course boundaries. Without these features, the pro shop has to rely on starters and other staff to keep track of the carts and the pace of play. I remember having to physically count the carts in the barn at the end of the day to see if any where missing, and if we were one short it was tough to know whether it was still on the course, dropping clubs at a member’s house or simply stolen. Operators also benefit from ongoing tracking and graphic presentation of total cart usage and of needed maintenance like battery charging, battery replacement, or the need for new tires. All these activities that were manually performed can now be replaced by other tasks that help the course and its assets operate more efficiently and profitably. Profit sounds like it could be a bad word, however we have all seen too many great courses close because of lack of revenue or excessive operating expenses. With Visage on board, a foursome running eight minutes behind the desired pace can be sent a direct message that will show up on their cart screens. That same screen can also allow them to order lunch at the turn by simply entering in the order on the touch screen. The snack bar will even be able to tell when the order needs to be ready to not hold up the players. An added benefit that can be included with Visage is the Shark Experience. A little wait at a tee, no problem. The golfers can use the entertainment feature to watch golf tips, live sports or sports highlights to make the time pass swiftly and maybe even learn how to make their next drive a little better. Another player benefit of the instant communication between the clubhouse and any cart is that players can be warned of areas under repair or the approach of hazardous weather conditions that could suspend play. Players can also communicate back to the clubhouse if they have lost or found a club, so the problem can possibly be resolved before the round is over. Ever driven too close to a bunker, a water hazard or a green? Don’t kid yourself – we all have. The course operator can create restricted zones that will keep you and the cart out of trouble. A restricted zone warning will appear on the screen and the cart can be shut down if the driver does not heed the warning. Best of all, the many Visage features are available from a web-based portal, allowing the course operator to control nearly everything about their course from a smart phone or tablet. Visage is essentially the most advanced program for both golfers and course operators. It can enhance the playing experience and either control expenses or build revenue… or both. When GPS screens were first available on carts and the players did not have to use viewfinders or guesswork to plan their next shot, that technology was roundly accepted. Now Club Car and Visage have taken golf technology to a new and exciting level. Have questions about Visage? We did and had the pleasure of sitting down with Robert McElreath, Vice President of Connectivity for Club Car to ask those questions. GCR: When Club Car created Visage, was this done out of a request from course owners? Or did Club Car come up with the idea? How long did it take to develop? ROBERT: Both. Club Car continually engages with its partners and customers to address their needs, and we are always looking to evolve our product offerings. We are committed to providing our customers with products and services that will enhance their business and the golf experience for their customers. At the same time, as a leading manufacturer, we are always looking to evolve our products. Club Car began its partnership with GPSi, developers of the Visage software, over ten years ago. Visage software is a result of a collaboration between four companies who came together and brought the best of several different packages offering GPS tools. They consolidated and took the best each had to offer and created Visage. Since then it has continuously been enhanced and evolves – and today it’s integrated and known as the Visage Fleet Management which allows you to monitor the health of your fleet, maintain course boundaries, improve pace of play and communicate directly to vehicles. When paired with The Shark Experience, the system connects golfers and the course in a whole new way by incorporating technology and streaming media content. The nature of this technology, like many products, is designed to evolve and improve over time. GCR: What has been the #1 key contributor to the Visage success story? ROBERT: Club Car is providing a very real solution to its customers – golf course owners and operators, golfers themselves and golf professionals. We have the backend support, and we offer proven technology that adds to the golf course/resort’s bottom line. Twenty years of customer feedback means it is a real solution that will help drive a customer’s business. Beyond that what helps to deliver it is a dedicated customer support team that is tied to each customer that helps them get the most out of the system. We also offer a variety of options to scale product to meet business needs and budget requirements. GCR: How many courses in the world have incorporated the Visage Fleet Management system? ROBERT: Over one thousand courses worldwide are using Visage and/or Club Car’s technology. As we continue to evolve our offerings like our Tempo Connect fleet with Visage and Shark Experience, we’re able to deliver an excellent experience for golfers and help course managers realize efficiency and an improved bottom line. For example course (s) are saving money and making money with Visage. If their goal is to increase food and beverage sales or they want to reduce golf course maintenance or improve the pace of play, Visage is a system to help you do that and more. A lot is dependent on their goals and how Visage is used. GCR: Visage helps golf courses reduce costs and increase revenue. Do you have any indication as to the percentage increase in profit this has yielded on average for courses? ROBERT: It’s really about the priorities of the course – some courses apply the technology with a greater focus on reducing operational costs, while others are geared to revenue increases. Both have been proven to drive improved financial performance at courses. Additionally, there are other benefits including delivering a better customer experience for your customers and the learnings and insights gained from analytics provided by the system. GCR: Can you share what the future of Visage looks like? Does Club Car envision this system as a usable platform for other fleets in universities, business campuses and other areas where golf car/utility fleet vehicles are used? ROBERT: The value of being closely connected with the course and getting real-time feedback and insights from customers allows us to create a pipeline of future possibilities within golf. And just as Club Car has grown beyond golf, we continue to explore how and where Club Car can apply the Visage technology to other areas in our portfolio. We believe this technology addresses the needs and desires of our other commercial and consumer vehicles and see it as a matter of time until we see this become more common to nearly every type of customer we serve. You can learn more about Club Car’s Visage on their website here.